Last Friday, my previous post on the assumptions of co-production went live on Limping Chicken. In that post, I talk about how, even in some projects described as ‘co-production’, the control seems to continue to sit with the university. There is another, larger, control that I forgot; the direction in which the project research focus goes. What do I mean by this? Well, who gets to decide who is the researcher and who is the subject. Following on from my ‘what if the Deaf community said “no”‘ post, here’s another bash at a ‘what if’. What if, we flipped the control of these research project areas, and the Deaf community got to control them? How far this disrupts the ‘normal’ set up for research demonstrates just how far we (I say ‘we’ – those of us within the hearing university) have been trained to not see how one-sided things are. How would the Deaf community manage funding, and would it differ from the way that universities manage it? Where would it allocate funding, to whom, to what? What are its overheads: people? buildings? pensions? management salaries? How much would be soaked up internally, and how much externally? How far could it leverage that funding to achieve project aims? What would it pay academic researchers? What would it ‘require’ from academics to make their contributions valid? There’s a scary thought for academics… rather than treating Deaf knowledge as something to pick through… what would happen if it was the Deaf community, and Deaf knowledge, that was considered the expert? Where it was Deaf knowledge that was the starting point, and Deaf interests dictated the focus of the research? Imagine a research project where hearing academics (or Deaf academics for that matter… why not?) were assessed for their relevance to the project based on their attitude, and their experiential fit with Deaf community knowledge. Who guides the project, decides where it should go, what (and who) its priorities are, where to focus (and stop focusing) next, how long it should run, and so on? Imagine if that responsibility was handed to the Deaf community, and the university were pulled in to deliver to Deaf-established project deliverables. I imagine we’d see clear changes to project time scales, relevance, judgements of ‘success’ etc. And, then, imagine what would happen if – instead of an academic norm (journal papers, conferences, books… all in high level academic language) the dissemination and communication of a project were in the hands of the Deaf community. Who would learn about the project? How? What would be said? In what language (or languages)? Through what media? Equally interestingly, who wouldn’t learn about it? And what wouldn’t be considered worth disseminating? Who researches whom? 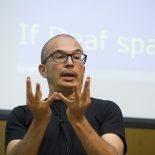 At the moment, except in more radical co-production projects where its the relationship between the University and the Deaf community that is being investigated, it’s usually the university that researches the Deaf community. What would happen, though, if the Deaf community researched the university… asking questions like ‘why is it there?’ and ‘who is it?’ and ‘what does it want?’ and ‘how does it work?’. Given some of the answers to these questions, I’m not sure that universities have really thought about the implications of co-production. The potential for radical change is truly terrifying (and utterly brilliant)! This entry was posted on September 22, 2014 by Mike Gulliver in Musings.